December is finally here and with it comes the Christmas Holiday. I want to say a sincere Thank You to everyone who has followed my efforts to share my story of food production. Thank you to everyone who has commented on posts, shared links, and offered many words of encouragement. I would like to return the favor with a Christmas Giveaway. Thanks to the great folks at Langston’s Western Wear I am giving away a free pair of boots and a great discount code to help you with your Christmas shopping (and maybe even buy something for yourself)! Justin Boots have always been some of my favorites and now I am excited to share these great boots with you. 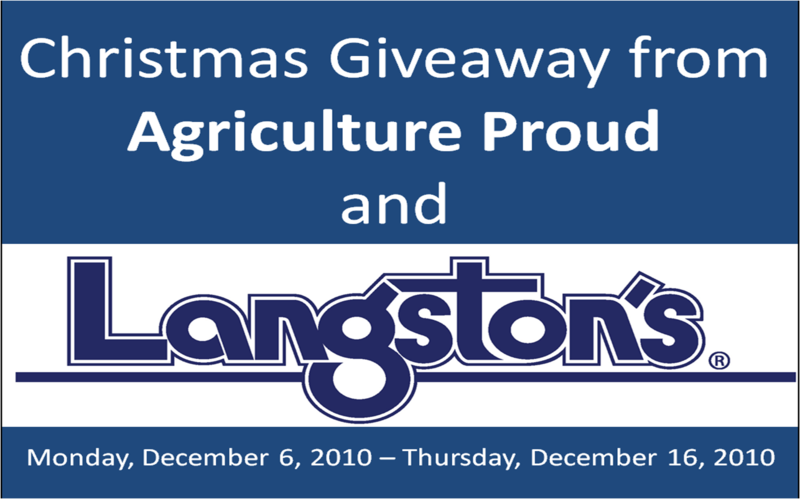 Not only can you enter to win a pair of Justin Bent Rail Boots, but you can use the coupon code “agproud” to receive 20% off orders of $100 or more online at Langstons.com. Offer expires December 18, 2010. The giveaway is for any pair of Justin Bent Rail Boots.The winner will be able to pick the boot of their choice from the Bent Rail line – Men’s or Women’s. Submit a photo that describes why you are Agriculture Proud via email (agricultureproud@hotmail.com), or via the I am Agriculture Proud Facebook group. Write a post on your site to describe why you are Agriculture Proud and leave a link in the comments on this post. The entry period for the giveaway is Monday, December 5, 2010 through 11:59pm Thursday, December 16, 2010. The winner by a random drawing from qualifying entries will be announced the afternoon of Friday, December 17, 2010. Get started on those entries. I look forward to the comments and photo submissions. Remember to use the coupon code to get a great discount on your Christmas shopping. Great giveaway! I follow Langston’s on Twitter. I also like Langston’s on Facebook. Boots? In time for CHRISTMAS? This can’t be true! Awesome! These are some of my favorite boots and need a new pair badly! I follow Langston’s on Twitter. I also ‘like’ Langston’s on Facebook. I like Langston’s on Facebook! I follow Langston’s on twitter! I like Langston’s on Facebook. I am a grandpa who was F.F.A. vice-president in highschool, and wear boots year round, but mine are worn out. I’ve been good Santa, Honest! LOVE these! oh, and I liked them on facebook. You are soooo talented in writing. God is truly utilizing you in miraculous methods. You are doing a great job! This was an awesome weblog! Exactly. No Farmers. No Food. No Future…Unless we all want to eat lab made supplements. One can never have too many boots! I like on Facebook. Proud to be raised on a farm!! Learned everything I need know growing up in agriculture! Would love to win a pair of Justin boots! They are soo comfortable! I would love to win a pair of boot for my hubby for Christmas…. Or even for myself!!!! Please enter me to win!!! Langston Western Wear sent me here!!! Boots for Christmas would be amazing! I followed Langston’s on Twitter… thanks for the fun giveaway!